'Dice Step' system - a variable dice 'size' is rolled against a static target number. For example, the target number if Savage Worlds is a 4, for UniSystem it's a 9. 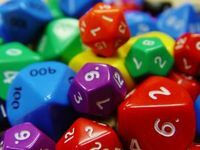 As a player gains skills or levels or bonuses, they can use different dice or more dice to reach the target number.